We picked our flooring for the downstairs and it's called "Manchurian Walnut" which keeps triggering my brain to think "Manchurian Debate" and "Manchurian Candidate", the latter being a 1959 book (and 1962 and again 2004 movie) about some dude who gets brainwashed into being an assassin for the Communist party. Which is fitting for that 50s era. But anyway, so I would imagine the Walnut tree used for the flooring is from somewhere in Manchuria. Manchuria! It just sounds like a word you should always say with exclamation points. And with your hangs on your hips and elbow out. Kind of like the Rum Captain stance minus the lifting of the leg. 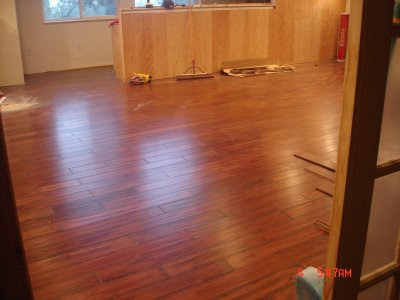 The flooring is a "special order" from Home Depot and we are awaiting its arrival - 7-10 days! Ack! I am really hoping it's earlier - the flooring lady (I always name people like that, like "hair lady" for a sylist - I have no idea why I do that), said it's been shipping pretty quickly, so I am hopeful. I have a self-imposed deadline to have it done before the in-laws arrive on October 6th. Ideally, I would be installing on the 3rd-ish, though this plan may all be shot to hell because you're supposed to let the floor "acclimate" (i.e. languish in it's uselessness) in the room before installing. Feh. Achieving my deadline entirely depends on when it arrives. The one nice thing the Flooring Lady did for us was get us 12 months no interest financing. I was bemoaning the fact that it was only 6 months no interest, and apparently, you can call the credit center and ask them for the 12 month deal and sometimes they'll give it to you! Must depend on how much action the Credit Center Dude got the night before if he is feeling generous enough to give you the 12 months deferred. That makes the $1800 spread out to $150-ish each month. It essentially forces me to save that $1800 bucks by making me pay the $150 monthly rather than shelling out 1800 bucks from savings right now. I wouldn't use it if it wasn't 0% interest, though. I don't recall exactly where I five-finger-discounted these pictures but, they are from some blogs that mentioned they used the flooring, though it wasn't the click stuff I got. 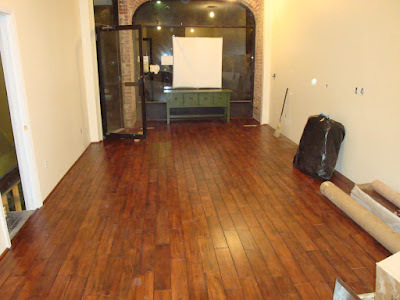 However, it looks the same - it's the same flooring with 3 different options (solid, engineered, or click). I thought about doing the engineered wood with a glue down installation but from what I understand, floating installations are more forgiving of variations in the flatness of the slab. Also, it's going to be a whole lot easier to install. After 700 square feet of saltillo tile, easy install sounded really nice. I have delusions that it will be a piece of cake - which is stupid. Home improvement projects are never without snags, but I am an optimist when it comes to DIY. Or rather, I am foolishly confident. Which I think you need when you're undertaking DIY projects. Or else you'll never do them. Somewhere around 60-70 square feet remain in the tiling project. I am so close! Tonight I'll tackle 30-40 square feet - so come hell or high water (sorry, Georgia, pun not intended), the tile will be done this weekend... let's not talk about the fact that I still have to clean the entire floor with an acidic solution (white vinegar and water) and apply two more coats (on top of the the 3 already on there) of sealer in order to be truly done. Bah. If you tiled the entire house, this floor will be a snap for you. Literally. We did several rooms in the last house and it only took a full working day to get them done. You will probably do it in half that time. The wood floor is beautiful. I'm so darn jealous. I would love to take out all of our flooring and just have wood throughout the house. Maybe I'll play the lotto.